Databases have long been an important part of your average architecture and arguably the most important. These days the trend has moved toward most parts of your infrastructure being disposable and stateless, which puts an even greater burden on your database to be both reliable and secure, since all of the other servers inevitably store stateful information along with the rest of their data in the database. Your database is the jackpot that every attacker aims to capture. As attacks get more sophisticated and networks get more hostile, it’s more important than ever to take additional steps to harden your database. MySQL has been a popular and favorite database of developers and administrators for its speed and overall ease of use. Unfortunately, that ease of use comes at the expense of security. Even though MySQL can be configured with tight security controls, your ordinary default MySQL configuration probably doesn’t use them. 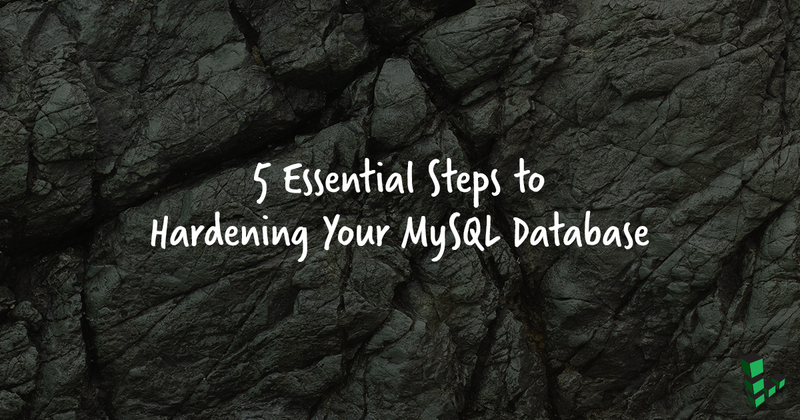 In this article I will cover five important steps you should take to harden your MySQL database. It’s important for all your database users to use strong passwords. Given that most people don’t manually log into a database all that often, use a password manager or the command-line tool, pwgen, to create a random, 20-character password for your database accounts. This is important even if you use additional MySQL access control to limit where a particular account can login from (such as limiting accounts strictly to localhost). The most important MySQL account to set a password for is the root user. By default in many systems, this user will have no password. In particular, Red Hat-based systems won’t set up a password when you install MySQL; and while Debian-based systems will prompt you for a password during interactive installs, non-interactive installs (like you might perform with a configuration manager) will skip it. Plus, you can still skip setting a password during interactive installs. So if you don’t set a password for the root user, anyone who may be able to get a local shell on your MySQL machine now has complete control over your database. If you identify any other anonymous users, be sure to delete them as well. Only give an account the access it needs to do the job and nothing more. If that user only needs access to a particular table (say, the users table), replace ``mydb. *`` (which grants access to all tables) with ``mydb.users`` or whatever the name of your table happens to be. Setting strong passwords only gets you so far if an attacker can read your password or other sensitive data as it passes over the network. Therefore, it’s more important than ever to secure all of your network traffic with TLS. For extra security, also add the ``ssl-cipher`` configuration option with a list of approved ciphers, instead of just accepting the default list of ciphers, which may include weaker TLS ciphers. I recommend either the Modern or Intermediate cipher suites as recommended by the Mozilla Security/Server Side TLS page. While most people these days know how important it is to protect user database-stored passwords with a one-way hash (ideally a slow hash like bcrypt), often not much thought is given to protecting other sensitive data in the database with encryption. In fact, many administrators will tell you their database is encrypted because the disk itself is encrypted. This actually compromises your database hardening not because disk encryption is flawed or bad practice, but just because it will give you a false sense of security. Disk encryption protects your database data should someone steal the disks from your server (or buy them secondhand after you’ve forgotten to wipe them), but disk encryption does not protect you while the database itself is running, since the drive needs to be in a decrypted state to be read. To protect data that’s in the database, you need to take the extra step of encrypting sensitive fields before you store them. That way if an attacker finds out some way to do a full database dump, your sensitive fields are still protected. There are a number of approaches to encrypting fields in a database and MySQL supports native encryption commands. Whatever encryption method you choose, I recommend avoiding encryption methods that require you to store the decryption key on the database itself. Ideally you will store the decryption secret on the application server as a local GPG key (if you use GPG for encryption) or otherwise store it as an environment variable on the application server. That way even if an attacker may find a way to compromise the service on the application server, he’ll have to turn that attack into local shell access to get your decryption key. There are many ways to lock down your MySQL server. Exactly how you implement some of these steps will vary depending on how your own database is set up and where it sits in your network. While the previous five steps will help protect your database, I’d argue the most important overall step to master is the principle of least privilege. Your database likely stores some of your most valuable data and if you make sure that users and applications only have the bare minimum access they need to do their job, you will restrict what an attacker will be able to do, should the hacker find a way to compromise that user or application. About the blogger: Kyle Rankin is an award-winning IT journalist and author, who has written or contributed to more than a dozen books on open-source nuts and bolts, including the Knoppix Hacks series, The Official Ubuntu Server book, and DevOps Troubleshooting. His latest, Linux Hardening in Hostile Networks, has recently been published by Prentice Hall. He is a columnist at Linux Journal magazine and speaks frequently on security and open-source software, including at O’Reilly Security Conference, BSidesLV, CactusCon, SCALE, OSCON, Linux World Expo, and Penguicon. A specialist in Linux administration, automation and security, Kyle’s expertise as a senior systems administrator comes in handy at his regular 9-to-5 as Vice President of Engineering Operations at Final, Inc.
You can stay current with Kyle’s latest tips, tomes, presentations and Perl scripts at kylerank.in or @kylerankin. Please feel free to share below any comments, questions or insights about your experience with hardening your MySQL database. And if you found this blog useful, consider sharing it through social media.